Have you ever been put on hold for a long time and then been disconnected? Maybe you’ve searched and searched and searched online and can’t find what you’re looking for? Or, perhaps you’ve called and been unable to speak with a human being, despite hitting buttons over and over again? I’ve experienced crazy-making situations like these many times, but perhaps the most frustrating happened recently when I tried to get some information from the Oakland Unified School District (OUSD). 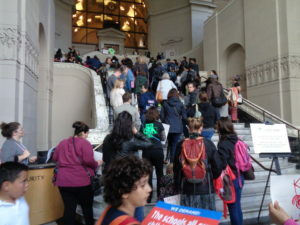 I was writing an article about concerns that parents and teachers have around anticipated budget cuts (http://oaklandvoices.us/east-oakland-parents-teachers-oppose-cuts-schools/). Over the course of two days, I’d attended a community meeting at an elementary school, a rally in downtown Oakland, and a school board meeting. I understood the concerns of parents and teachers (e.g., classes possibly being combined; cuts at the school level, but maybe not at the central office). It appeared that the district hadn’t provided much in the way of specifics, so I wanted to speak with someone at the central office who could tell me what was being proposed. I anticipated that I’d be able to get answers within a day or so, but it was a multi-day, multi-week, multi-step effort just to talk with someone who might be able to provide some answers. As I had recently attended a school board meeting where parents and teachers shared their concerns, I thought a good first step would be to talk with someone on the school board, such as Nina Senn, my school board representative. 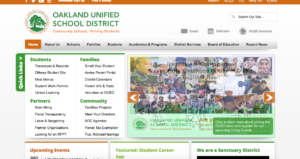 So, I went to the OUSD website (http://www.ousd.org/), where there’s a link to the School Board (http://www.ousd.org/domain/63). I didn’t find a phone number for Senn, but was able to email her. She replied within hours and referred me to the board president, James Harris. “Our Board President is the official spokesperson for the Board so I have copied him on your request and he would be happy to speak with you,” she wrote, and copied Harris on her email. After several days, I hadn’t heard from Harris, so wrote again to Senn, copying Harris. It was lmost two weeks later that Board President Harris called me, soon after I sent another email to Senn, copied to him, with a list of questions. The conversation with Harris was pleasant, but he said he wasn’t able to answer any of my questions, including why the board had signed off on huge increases in the number of highly-paid administrators at central office under the previous superintendent, Antwan Wilson. He directed me to speak with the interim superintendent, Devin Dillon, and gave me a number to call. The number Harris gave me was to a general school district number, 510-879-8200. It gives callers eight options, including #6 for the superintendent’s office. I called and pressed #6 repeatedly over several days, but the phone just rang and rang and rang. I wasn’t able to leave a message. I then went to the district’s website to find a public information officer. I searched a multitude of terms in the Search Our Site box, including “public Information,” “PR,” “communications,” and “public affairs,” but had no success. So, I called the district’s general number once again and eventually got through to a telephone operator, who told me there wasn’t a public information office and I should call Isaac Read in the communications department. When I called this number, I got a message that indicated that it was Valerie Goode’s and to leave a message, but her message machine was full. I wasn’t sure I was in the right department, so I called the operator again. I did this several times as the numbers I got were either to the wrong department or someone no longer working for the district. At this point, I thought that Valerie Goode might be the person I was looking for, so I went online and Googled her name. I fairly quickly found a district announcement from August 2016 that said that John Sasaki had been appointed director of the Communications & Public Affairs Department and Valerie Goode was the assistant director. And it listed their contact information. Bingo! I thought. I sensed I was getting close after almost three weeks of making calls and sending emails. I contacted both Goode and Sasaki. I got to speak with Goode, who said she’d check with the appropriate departments and get back to me. Sasaki responded to my written questions with links to websites that either didn’t say much or were very detailed and almost incomprehensible (e.g., the Budgeted Expenses Dashboard at http://www.ousd.org/fiscaltransparency). After I wrote back mentioning this, he called me soon after and we talked. He commented that he didn’t have answers to my questions, but they should be revealed at the school board meeting the next day. It would also be very helpful if the district were to: a) regularly update contact information and answering machine messages, and b) make sure the district telephone operators have up-to-date information. It’s just amazing that you emerged from the ousd labyrinth with your marbles still intact. Many of us might have committed mayhem or worse. You’re a suvivior!